Coleen grew up in Southern California not far from the coast. Even though she grew up just 90 minutes from then Wycliffe headquarters in Huntington Beach, she had never heard of Bible translation. Then at the age of 18 she spent a year as a foreign exchange student in Germany where she first heard about linguistics, Bible translation and cross cultural service. Her call to cross-cultural service was the answer to her prayer, “Show me what you want me to do with my life!” Cross-cultural service has been her passion ever since. She especially delights in training and mentoring and generally passing on information whether linguistics or life experience. 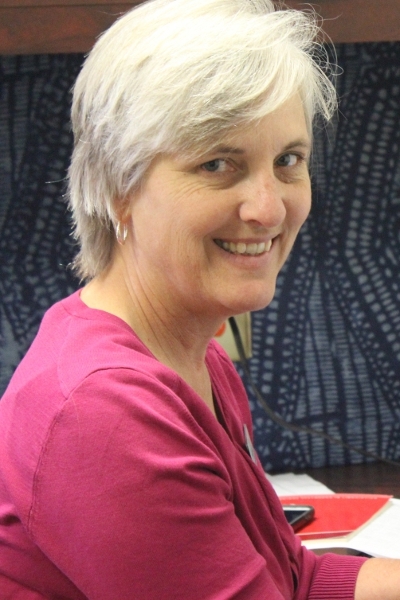 Coleen joined Wycliffe in early 1986 and spent the 1990s as a part of SIL’s work in Togo where she was assigned as a Linguist/Translator to the Akposo project. She returned to Dallas in 2000 to work on her PhD in linguistics at UTA where she met Ervin. She’d be happy to tell you of their courtship, but it is much more entertaining when Ervin tells the story, so ask him. “Marrying Ervin is the second best decision I’ve ever made,” she claims. In 2010, the two of them went to Nigeria to teach at the Theological College of Northern Nigeria. Coleen also became the linguistics coordinator for SIL Nigeria. When she’s not teaching a course at Dallas International, is also the linguistics coordinator for Africa West Area and all that means is that she has more Skype meetings to attend. SIL’s work in this area is all in Nigeria. Coleen likes to read and write and talk about interesting things and hang out with people who like to do the same. But she has also been known to play an instrument or two, or maybe three. But only one at a time. 2009. “Review of: The origins of vowel systems: studies in the evolution of language 1, by Bart de Boer” SIL Electronic Book Reviews 2009-006. 2007. “F1 and Center of Gravity Interplay in the Maintenance of Phonological Height within a Statistical Model of a Communal Grammar: The Case of Foodo [ATR] Acoustics” UTA Working Papers in Linguistics 2006-2007:2-29. 2003. “In Search of an Acoustic Correlate to ATR in Ikpɔsɔ.” Linguistic description: typology and representation of African languages. In Trends in African Linguistics Vol. 8. John M. Mugane, ed. Trenton: Africa World Press. Phonetics’. Presented at the Jos Linguistics Circle, Plateau State, Nigeria. 2009. (with Phil Davison) [ATR] in Konabere Syllabic Nasals: A Pilot Study. Presented at the GIAL Academic Forum, Dallas Texas. 2006. The Acoustic Analysis of the Vowel Systems of Three GMT Languages: Ikposo, Tuwuli and Foodo. Presented at the Ghana-Togo Mountain Languages Workshop in Ho, Ghana. 2006. The Search for a Reliable Acoustic Measurement of ATR: The case of Foodo. Presented at the 14th Annual UTA Student Conference in Linguistics, Arlington, Texas. 2005. The Practical Application of Linguistic Theory and Phonetic Software to a Linguistic “Problem”: the case of Limbum [æ]. Presented at the 13th Annual UTA Student Conference in Linguistics, Arlington, Texas. 2004. GIVE and TAKE Serial Verb Construction in Ikpɔsɔ-uwi: a discourse perspective. Presented at the 24th West African Linguistics Conference, University of Ibadan, Nigeria. 2002. In Search of an Acoustic Correlate to [ATR] in Ikpɔsɔ. Presented at the 33rd Annual Conference in African Linguistics, University of Ohio, Athens, Ohio. 2002. The Chiastic Nature of Ikpɔsɔ Argument: A Rhetorical Structure Theory (RST) Analysis. Presented at the 9th Annual UTA Student Conference in Linguistics, Arlington, Texas. 2001. Mɛ and kʊ and mainline in Akposso narrative, procedural and expository discourse. Presented at the 8th Annual UTA Student Conference in Linguistics, Arlington, Texas.